In the Bible, Matthew 7: 1-5 says 7 “Do not judge, or you too will be judged. 2 For in the same way you judge others, you will be judged, and with the measure you use, it will be measured to you. 3 “Why do you look at the speck of sawdust in your brother’s eye and a pay no attention to the plank in your own eye? 4 How can you say to your brother, ‘Let me take the speck out of your eye,’ when all the time there is a plank in your own eye? 5 You hypocrite, first take the plank out of your own eye, and then you will see clearly to remove the speck from your brother’s eye. I think a lot of times as Christians we sometimes find ourselves judging other people in this world and looking down on others. It’s really easy to be a critic! I’m a great critic and love doing it, but it’s also easy when you don’t take yourself into account. The Bible says that instead of just walking around telling people they are wrong, we need to help them out and show them the right way. Before we do that, we must make sure that we ourselves are on the correct path. So in other words, don’t blame or tell something another brother or sister is doing wrong when you are doing wrong all at the same time. 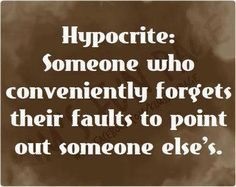 The Bible calls those types of people hypocrites! A simplistic example of what we do in our spiritual lives is something I witnessed one time. My dad and I were riding on some back roads to some hunting land when we came to a 4-way stop. A truck that had prisoners in it, who, judging from the trash bags in the back, had obviously been picking up trash was in front of us. We are riding along and all of a sudden one of the prisoners rolls down a window and throws out a piece of trash! Now that’s a hypocrite! I can promise that God is not letting a hypocrite into Heaven. We need to sometimes check ourselves, so to speak, and make sure we are not being one of those hypocrites. It’s okay to help someone out in a nice way. We just first need to make sure our lives are in order also. ​Finish! John the Revelator implores the church at Smyrna to remain faithful until death in Revelation 2:10. Fear none of those things which thou shalt suffer: behold, the devil shall cast some of you into prison, that you may be tried; and ye shall have tribulation ten days: be thou faithful unto death, and I will give thee a crown of life. The churches that John wrote to, such as Smyrna, here in Revelation were under the Roman rule of Emperor Domitian who was inclined to cruelty against Christians. He was very creative in his execution of Christians and made it his mission to stamp out any sign of Christianity. 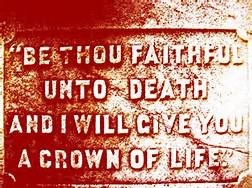 As a result, many Christians were silenced by such persecution and John encourages them to be “faithful unto death” and God had promised them a crown of life. It would seem that many today make this their goal, yet fail to follow through when they see what surrounds them. But we cannot stop short. Paul encouraged the church at Galatia to finish the Christian race completely in Galatians 6:9. And let us not be weary in well doing: for in due season we shall reap if we faint not. Paul encouraged the church at Thessalonica to do the same in II Thessalonians 3:13. The point is that many today stay faithful for a time, some for many years, but fall off the wagon so to speak before this life is over. It’s crucial that every Christian understands that we cannot reap the heavenly promises made to us by God if we do not finish! Don’t quit! When you’re struggling and it seems you can’t recover, don’t give up! Don’t quit until you succeed. Paul certainly knew about being faithful unto death as he said in II Timothy 4:6-8. For I am now ready to be offered, and the time of my departure is at hand. I have fought a good fight, I have finished my course, I have kept the faith: Henceforth there is laid up for me a crown of righteousness, which the Lord, the righteous judge, shall give me at that day: and not to me only, but unto all them also that love his appearing. Paul certainly knew about persevering to the end and he certainly did so after being a great tool for the Lord’s church. Matthew 24:13 says, “But he that shall endure unto the end, the same shall be saved.” It is this writers prayer that all Christians today would look to our Biblical examples and strive to be faithful unto death so that we too may receive a crown of life. ​Pretzels are a delightful treat, but as tasty as a pretzel is, Johann Tetzel was a man of extreme distastefulness. This loathsome fellow was a Catholic friar who lived in the days of Martin Luther (1400’s) and is best known for the selling of indulgences. Indulgences were basically a license to sin that came at a pretty penny marked up by Mr. Tetzel. For example, you want to commit adultery? Go buy an indulgence from Mr. Tetzel and you can commit all the filthy, satanic adultery your heart desires. 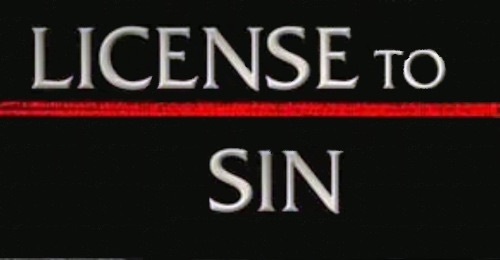 Don’t worry, your sins are excused because of your worthy investment in that piece of parchment…a license to sin. If you are a young person, you need to know how to respond to your friend who utilizes God’s grace as an indulgence. That’s right, people are using the free gift of God as a license to sin. The argument goes like this, “We are all sinners. We are going to sin no matter what, but it’s okay because God is gracious and forgives us whenever we sin. I know it’s wrong to lie, but isn’t it also supposed to be a sin to lust after a woman?! You just have to trust in the grace of God.” That argument sounds pretty attractive. If that argument was adorned in a dress and batting eyelids, any young man might fall for it. There is only 1000 things wrong with it. ​God’s grace does not give us a license to sin. Paul addresses this very concept in Romans when he declares, “What shall we say then? Shall we continue in sin that grace may abound? Certainly not! How shall we who died to sin live any longer in it?. We should no longer be slaves of sin,” (6:1-2,6). God’s gift is free to us, but it was not free to Him. There is an old saying that there is no such thing as a free meal. The idea is that the meal cost somebody something whether it was free to you or not. God’s grace is offered freely to us but cost Him the blood of His Son, Jesus the Christ. When proclaimed Christians use God’s grace as a license to sin they are blaspheming the precious name of Christ and wiping their feet in His blood like the devil himself. ​We may sin as Christians, but we should not be “sinners”. When Paul says in Romans 6:6 that we should no longer be slaves of sin, that is simply saying that Christians are not or should not be habitual sinners. Hopefully as Christians we have put off the old man (Eph. 4:22), and when we do sin from time to time, we confess that sin, repent of it, and ask for the grace of God. “If we confess our sins, He is faithful and just to forgive us from all unrighteousness,” (1 John 1:9). We should not accept incapability from the get-go and live off the grace of God like some undeserving Americans live off government welfare.